After a delicious breakfast of a tomato & cheese omelet, fruit, pan au chocolat and a latte, I took a walk down the driveway of Chateau Yering and turned into the lot for Yering Station Winery. Winemaker William (Willy) Lunn was my guide for the day. He explained to me how Yering Station Winery planted its first vines in 1838 on the property of a cattle farm. The barn still stands and is used for functions like farmers markets, and the Yering Station store does sell local food items, but the main product here now is wine. It wasn’t until the late 1980s that became the case as it had gone back to producing cattle during and after the depression before additional planting was done in the early to mid 1960s. 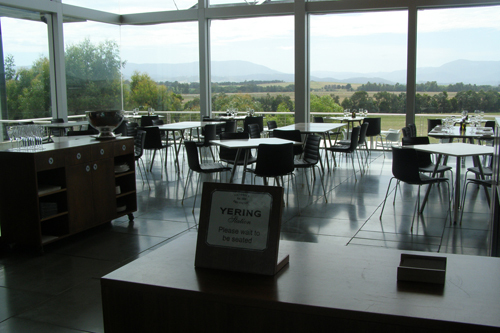 Yering Station is the third largest in Yarra Valley, behind Domaine Chandon and De Bortoli. They produce 12 different wines from the valley floor and also work with Devaux Champagne in France. The processing of the grapes – which are both hand and machine picked – is done outside. All of the barreled wine is put in French Oak and bottled under screw caps. The reserve labels are produced on small scale, only when the wine warrants it and Yering Station is working with technology that can actually lead them there before the wine is even tasted. They use a machine called EM38-MK2 to map the soil of the vineyards through sonic waves. Using this information, they can then change the irrigation as needed. The translation of technology to wine works for the still and sparkling wines of Yering Station. The Yarrabank 2005 Cuvee Sparkling is a 50-50 Pinot Noir-Chardonnay blend from the upper Yarra valley, which is high elevation. It’s pretty dry, but has a strong citrus back. The 2009 Sauvignon Blanc, on the other hand, is very light with more grapefruit notes and very refreshing. The White Blend is an interesting mix of Viognier and two grapes I’m not too familiar with. Marsanne and Roussane. It was a little oaky with fruit and spices, a subtle flavor that will go better with food than on its own. At Yering Station I also tasted a 2008 Yarra Valley Sangiovese that was full of strawberry flavor, with a little spice. It was just dry enough to be complex, but the fruit kept it a bit sweet. Another interesting wine is the Yarra Valley Heathcote from 2007, the year a major frost wiped out a lot of the valley’s fruit. This wine is 95% Shiraz with just 5% Viognier. It’s strong in dark fruit, especially cherry, for a dry red wine. On the other spectrum, the Pinot Gris dessert wine is a delicious treat. And speaking of delicious, there is a restaurant at Yering Station with quite a gourmet menu. Over lunch I got to take the Rose, made from 100% pinot noir, with a strong strawberry nose and a bit of sweetness, despite its lack of residual sugar. I cannot bring myself to consider eating the kangaroo, which ,my lunch partner told me was tender and lean, but I really enjoyed the Eggplant tortilla, more of a lasagna of potato and eggplant. We finished with some interesting desserts and then Willy said something to me that I was starting to hear quite a bit of since arriving. It seems that in Australia, the winemakers finish their day with a beer! 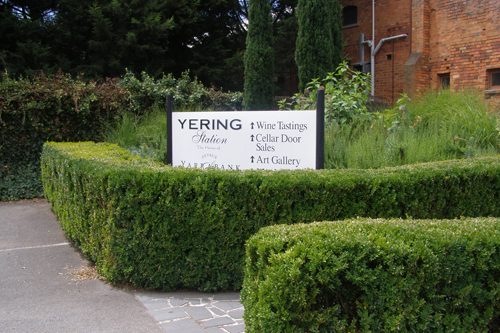 As he put it, “It takes a lot of beer to make good wine.” It is referred to in Yarra as “cleansing ale.” If you’d like to visit Yering Station, tours are on request only. 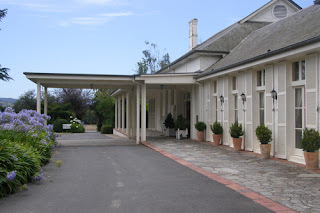 The tasting room, however, is open seven days a week, as is the restaurant. 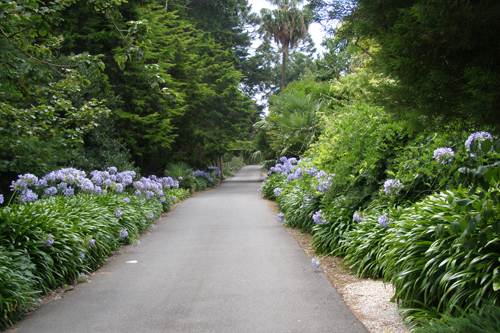 The walk back from Yering Station Winery to Chateau Yering is beautiful as the colorful trees and flowers lined the walkway. 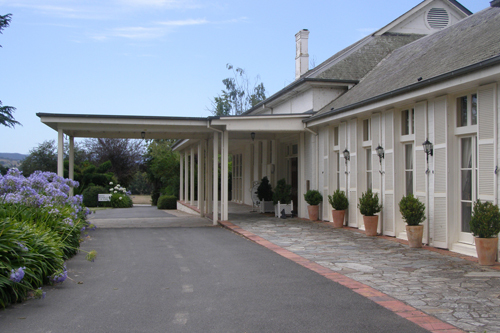 The grounds here are as beautiful as the inside of the Chateau and it’s definitely a place I’d like to come back to. I might actually be able to relax here and put the computer away if I had the time! 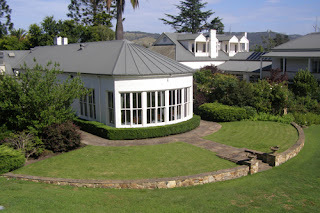 The day ended as the following would begin, in the company of the Webbers, owners of De Bortoli wine. Steve and Leanne invited me to join them and their daughters for a casual barbie. They poured some wine, put some steaks on the barbecue and we had some great conversation about wine and Australia. 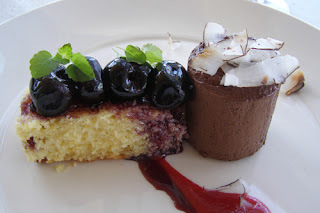 As good as the gourmet meals have been, this was even better and the best welcome I had received Down Under. It would only consider through my final day in Yarra Valley, which also happened to be Australia Day.